In the default edit mode, the graph view allows to set the position of nodes by dragging it. Furthermore, the path followed by an edge can be controlled using intermediate points, which are shown as red squares for the selected edge. Drag such an intermediate point to move it, or directly drag the edge itself to create and place a new intermediate point. These points can be removed with a right-click (or control-click). Visual properties of the graph elements can be defined in the Style tab. 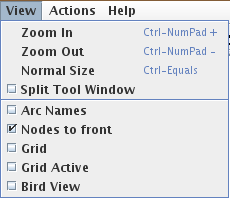 The View menu allows to control the zoom factor and to set some display options. Zoom In/Out and Normal Size: to control the zoom factor. Nodes to front: to move all nodes to front (above arcs) or to back (makes selection easier). The view menu also enables to apply Automatic layouts on graphs.